I LOVE NEW HAIR!!! This new Lizzy hairstyle from Monso is an adorable updo with bangs. This hairstyle has materials, which can be seen if you’re using the official SL viewer. 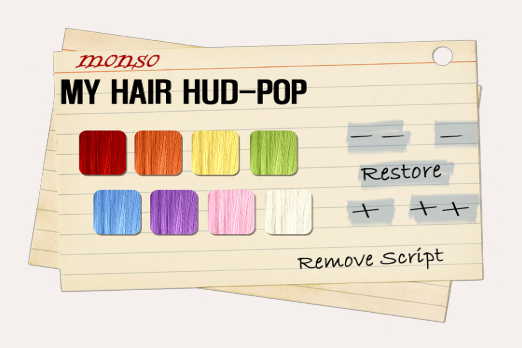 Since the last hair release, Monso created a new hair HUD and made new hair colors! Yay, I love HUDs too. The HUD also has a built-in re-sizer. Materials! It’s shiny and more prominent under certain lighting conditions. I moved my Sun/Moon slider around to show you guys how the lighting affects the texture. Katat0nik released the adorable Tulle Skirts! When she released the Imaginative School Girl Outfit last month, I fell in love with the Tulle skirt, so I asked for it as a separate item. I’m thrilled she made them, and even included a texture-change/tint HUD. I didn’t wear it in my post, but you can also get a free add-on waist band that goes with this skirt too. Love! Monso are great, I find myself buying every new thing they release, and I can’t even say the same for some of the bigger names out there.